The German airline pilot’s union Vereinigung Cockpit published a list of German airport that have “serious safety defects”, according to the organisation. Vereinigung Cockpit analyzed Germany’s 29 main airports, by checking a list of safety criteria. If an airport failed certain safety criteria, penalty points were awarded. The most important criteria according to the organisation were the availability of taxiways to the beginning of the runway and the availability of ILS in both directions of the main runway. 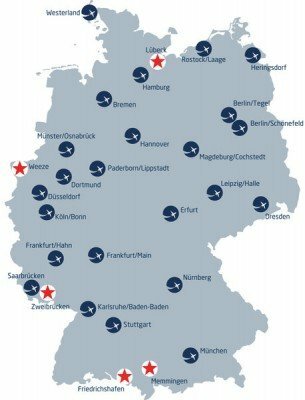 Five airports: Weeze, Memmingen, Lübeck, Zweibrücken, and Friedrichshafen did not meet their safety standards and were given a ‘red star’. The union acknowledges that these airports are all safe according to international standards. However, the union states that Germany should use stricter safety standards instead of international minimal limits. Lübeck Airport released a statement saying it was not possible to fulfill all of Cockpit’s criteria. Friedrichshafen called the inspections arbitrary, while Memmingen disputed the fact that not having enough taxiways was a safety issue. Weeze airport called the red star ‘outrageous’ and stated that according to the ‘arbitrary’ criteria, all Dutch regional airports would also have received a red star.